Product prices and availability are accurate as of 2019-03-21 16:13:39 EDT and are subject to change. Any price and availability information displayed on http://www.amazon.com/ at the time of purchase will apply to the purchase of this product. 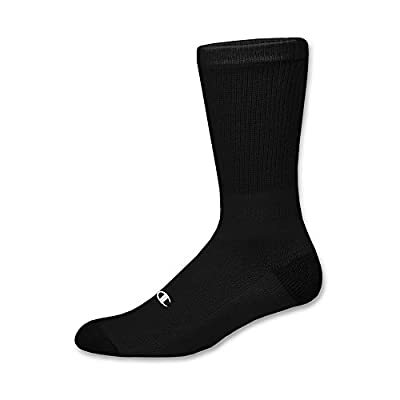 Looking for extra-large socks that fit right and feel fantastic? Try these Champion men's athletic socks&44; custom-made for big and tall guys. Soft cotton-rich yarns provide all-day breathable comfort. Double Dry fabric technology wicks moisture for constant cool. Allover knit-in stretch helps ensure shape-keeping fit. Plush inner sole cushions your every step. Smooth non-chafe toe seam goes easy on your skin. Reinforced grey heel and toe resist wear & tear. Classic crew length&44; with stretchy ribbed stay-up tops. NOTE: Size XL fits shoe sizes 12-14.